This book offers both sport psychology practitioners and sport athletes a clear understanding of mindfulness to help athletes optimize sport performance. It provides a clear insight how sport athletes can learn to increase their ability to concentrate, be fully present during high pressure competition and how to effectively respond to distracting thoughts and emotions (e.g. performance anxiety; dread). 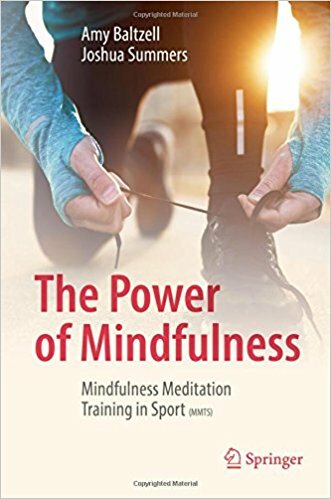 The strategies offered in the chapters are based on Mindfulness Meditation Training for Sport (MMTS), an empirically supported mindfulness intervention for sport, which was created by the authors. MMTS has been adopted internationally by practicing sport psychologists – used with collegiate, club, and Olympic teams. Through offering a clear explanation of mindfulness and self-compassion (an essential element of MMTS), brief mindfulness based practices, and consistently offering how such practices link to performance – the reader learns to implement all of MMTS or elements of MMTS to help the increase their ability to focus, cope with difficult emotions, and perform their best when it matters. Amy Baltzell is the Director of the Sport Psychology Specialization at Boston University within the Counselling Program. She earned a doctorate in Counselling Psychology, specializing in Sport Psychology, is an AASP (Association for Applied Sport Psychology) Certified Consultant, and a psychologist. She teaches a graduate course at Boston University on Mindfulness and Performance along with a range of courses in Sport Psychology. In the Spring of 2006, she taught the first Sport Psychology course offered at Harvard University. She also teaches courses in Positive Psychology, which she created. She is the author (2011) of Living in the Sweet Spot: Preparing for Performance in Sport and Life. She most recently edited a book, Mindfulness and Performance (2016) with Cambridge University Press. She has extensive experience personally and professionally in the area of preparation for competition. As a sport psychologist she has a private consulting practice in which she has been providing one-on-one sport psychology services to collegiate, Olympic level, and professional athletes. She also provides educational workshops and talks to coaches, sport teams, and clubs. She was a member of the 1989–1991 U.S. National Rowing Teams, the 1992 US Olympic Rowing Team, and the 1995 America’s Cup All-Women’s Sailing Team, A3. She served as the Head Varsity lightweight rowing coach (1998-99) at Harvard University. Joshua Summers: For twenty years, Josh has trained extensively in yoga and mindfulness meditation both in Asia and the United States, with two months of intensive training in a Burmese monastery. He now teaches yoga and meditation internationally and consults with performers and athletes on mindfulness skill-sets for optimal performance. Josh also holds a masters degree in Oriental Medicine and has a private acupuncture practice in Boston, MA. He earned his BA from Columbia University.